Is it true all good things must finally come to an end? It was certainly true for Playland at the Beach, the great amusement park that once promenaded along the western coast of San Francisco, out by the edge of Golden Gate Park. In its heyday in the Twenties, Thirties, Forties, even into the late Fifties, the place rocked with kids and young people and sailors and fun – and they measured their cost in nickels. San Franciscans didn’t need a car to get there because Playland was at the end of a couple of streetcar lines, as amusement parks usually were in the early twentieth century. I don’t know what happened, but parks like Playland were closing all over the country. Perhaps the opening of the original Disneyland in 1955 had something to do with it. Week after week Walt Disney used his television show, conveniently named Disneyland, to flog the wonders and delights of his new Magic Kingdom. Maybe the traditional family-oriented park at the edge of the big city was looking a little tawdry and old fashioned. Most young people had access to cars now. They could drive to big modern theme parks like Great America, the Bay Area’s first. It was (and is) just off the Bayshore Freeway, and, unlike Playland way out at the edge of a labyrinthine city, is easily accessible by millions of Bay Area families. Besides, by the 1950s, the blue collar and middle-class families that formed Playland’s primary market were leaving the City in droves, off to their new martinis and togetherness playgrounds in the suburbs. But let’s not talk about that sorrowful day in 1954 when the moving van arrived at our beautiful San Francisco house on 47th Avenue two blocks from the vast, fogbound, eternal Pacific ocean and trucked the furniture to our new, open floor plan, wall to wall windows and a patio, subdivision miracle stranded on a mudflat on the San Francisco Bay. It’s too traumatic. I think I’ve been trying to get back home my whole life. The young urban professionals who took their places, filling the swinging Tony Bennett bars on Union Street, were not likely to suggest a date night at Playland riding the Wild Mouse. Photo of Playland, 1958 by my brother Gary. This entry was posted in Ghosts of the Past and tagged playland-at-the-beach, san francisco, san mateo by ponderpig. Bookmark the permalink. I remember that photo of the green 52 Chevy with the attractive lady, Susana, leaning against the fender, with one in her pouch at the time.I believe it was right across the Great Highway in the background where they sold the “It” ice-cream sandwich bars, that a reader mentioned on an earlier date. When I was a kid, many moons ago, there was a place out at Muskego Beach and it was called “Dandelion Park”. In my early days, it was roller coasters and bumper-cars. The had the mouse ride, a thing called the “Tornado” and the “Whirling Dervish” which was guaranteed to twist an intestine. From about 1940-1970 it was THE place to go. It was the escape from the city, escape from routine and, in my early teen years, escape from reality. Take a gal there and you were a big spender. Survive the day there with her and you’d probably be betrothed.It was no Playland on the Great Highway, but we had a beach and girls wore bikinis and us fellas felt like kings. It wasn’t a nickle, but a dime was just as good. I HAVE BEEN TRYING TO FIND ANYONE THAT HAS PICTURES FROM “MUSKEGO BEACH” AND “DANDELION PARK” I HAVE SO MANY FOND MEMORIES OF THIS AMUSEMENT PARK THAT WAS SO CLOSE TO MILWAUKEE. I WENT THERE IN THE 60S. I HAVE DREAMS ABOUT THAT PLACE TO THIS DAY! I REMEMBER ALL THE RIDES AS WELL AS THE BALLROOM. DO YOU KNOW OF ANYONE THAT HAD THE MIND TO TAKE PICTURES OF THE PARK RIDES? THE WOODEN ROLLER COASTER? HOPE TO HEAR FROM YOU. I just updated the wikipedia entry for Muskego, and on it I updated the references to places that contain information about the park. In particular there are pictures from the roller coaster database (rcdb.com) and from the muskego historical society. My mother, grandparents and mother’s siblings ran the park in the 1930s – 1940s. I occasionally try to find more information on the park (photos, postcards, etc.) but do not come up with much. I would be interested in what others out there may have. I was at the park in the late 1950s / early 1960s, but it was on its downward trend by then. Were your parents etc. related to the Whitney brothers ? They were actively involved in managing Playland and the family has much memorabilia including film of Playland in its glory days. Wow, what a multi-faceted piece you’ve got here, stringing together the closing of these smaller amusement parks (Playland, Ocean Park, etc.) for bigger and newer places like Disneyland, and Families like yours leaving for the suburbs. And, wow, you lived in a great location! What kid would want to leave? Again, I love reading your SF memories…especially places I remember from my childhood. I didn’t quite leave my heart there, but the city is embedded in my skin. Like you, I’ve been trying to get back home again. Maybe that’s why I like to write so much about my childhood, and the good memories; it’s the only way I can visit those times and places. I’ve got a copy of the 1945 floor plans to Playland-at-the-Beach, let’s rebuild the whole 4 square block park! The octopus was an 8 armed ride that had 2 person open cabs at the end of each arm. It moved in a circular motion as well as up and down. The cabs would spin as well. I think that you are thinking of the diving bell, which was in the middle of the north half of the Playland complex. I remember it well, as I worked as a high school student for several years at Smith’s Yum-Yum, that made caramel corn and salt water taffy. I spent many evenings popping corn at the stand in the midway right across from the diving bell. Finally, someone who actually worked at Smith’s Yum-Yum!!!!! My whole family lived in the Sunset and we all grew up at Playland. My Grandmother was WILD for the Puffed RICE Yum-Yum, and I have been looking for a recipe for it for YEARS!!!! Is it possible that you may have that recipe or point me in the right direction to find it? Thanks VERY much for any help!!! Playland now re-appears in my just released book, San Francisco’s Playland at the Beach: The Early Years, covering 1914-1945 with around 250 photos of Playland. 1945-1972 will follow next year. I’ll be appearing on KGO this Friday night at 11:00 with John Rothmann to talk about Playland. I hope you’ll call in. You can get the details on my site at http://www.historysmith.com/speak_tour_01.html Listen live via radio or PC link (on my web page). If you want to purchase a signed copy of San Francisco’s Playland at the Beach: The Early Years, you can do so from my site or preferably at Playland Not at the Beach’s site at http://www.playland-not-at-the-beach.org/ I can even inscribe it for you if you order it from them. Just ask. I’ll be at Playland Not at the Beach December 4 to do a slide show and to sign books. Feel free to bring in your own copy there or to any of my other events. Excellent work, Jim. I am looking forward to seeing (and purchasing) your new work. Jerry, there were no live sea lions in my time, except cavorting out on Seal Rocks. However, that doesn’t mean they were never there. Adolph Sutro could have had an attraction of that kind that predated Playland. I suggest you ask over at Outsidelands – http://www.outsidelands.org/index.php Those guys are absolutely the best source for obscure history in the eestern neighbohoods of San Francisco –(and they run my articles, so they must be good) Tell Woody I sent you! I don’t believe there were any live animals there except for a short period perhaps when Marty Davis ran it at the end with West Coast Shows. It’s far more likely the sign was hung at the Whitney’s Cliff House. Either way, it’s a treasure. Would you consider displaying it at the Conservatory of Flowers in November for about 6 months? http://www.conservatoryofflowers.org I’m helping with a Lands End display including Playland, the Cliff House & the Sutro Baths & we’re looking for memorabilia to display. I have two different sauce recipes but am not sure either is authentic. I would join The-Original-Hot-House-From-Playland and ask. 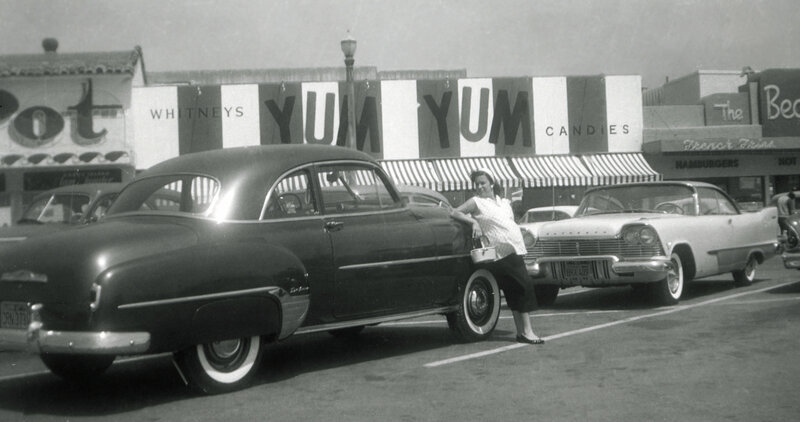 By any chance does anyone have any pictures of Smiths Yum Yum from about 1940 to about 1952. My dad and grand father worked there and would love to see some old pictures that might include them.